This project was my introduction to construction, a G family tradition. Alas, I do not have any photos of the garage spaces as they were when we arrived, but picture in your mind a 30′ x 30′ garage, stocked with tools, wood scraps, extra refrigerators and appliances, about 8 bicycles, 2 barbecues, 30+ cans of paint, a couple of those Little Tikes cars that look like a Dr. Seuss-version of a VW Bug, and plenty of other stuff. The ceilings were open to the rafters and there were mousetraps and dead crickets to be found in every corner. All in all…a garage, not a living space. When family holidays roll around this house is packed to the gills with relatives and friends, and it was becoming apparent that another cozy living area would be helpful. Not to mention, the new room was destined to become our living quarters for while we’re living here at the farm, so the pressure was on. We had 7 weeks from when we arrived to get it ready for Thanksgiving. 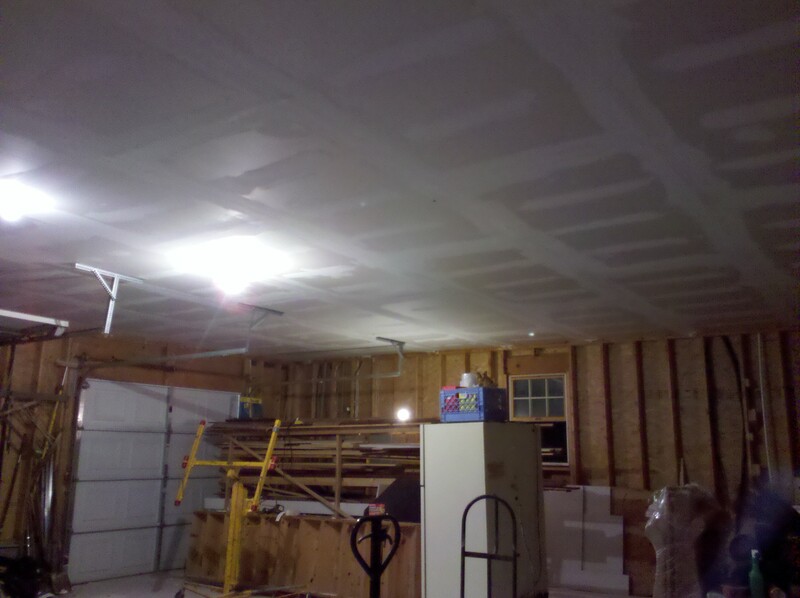 We framed out the space, put up sheetrock, insulated (which, I have found, I am pretty decent at), spackled, spackled, spackled, plumbed (ok, that was Dad G and M; I didn’t get involved), sanded, painted, tiled, installed shelves and doors…. Here are a few photos – very hard to capture everything but I hope this gives a hint of what we’ve been up to. Dad G bought those bookcases from a Borders Bookstore that was closing down. Sweet deal, eh? There’s also a rolling ladder, to be installed soon. See why we call it ‘the library’? The closet looks beter with paint, huh? When you add molding and carpet to the paint, the closet looks really slick, no? Yeah, that’s right. I tiled a bathroom. The next stage was building out the woodshop, which has literally occupied our time since the holidays. This project is critical, because without the shop, our dreams of furniture building would be nonsense. Picture this space exactly as the other garage – a wide open box filled with bric-a-brac. We’ve put in insulation, sheetrock, paint and M’s building cabinets, setting up industrial machines and installing a dust collection system… we CAN’T WAIT to be finished, so look forward to some photos in the near future! I would bet at least a nickel – nay, quarter! – that if M. and B. were stranded on a desert island with a 2×4, a hammer and a quart of polyurethane, upon rescue one month later, they would have constructed a functioning shelter and working kale farm. Sweet deal on the Borders bookshelves! You’ve gotten so much accomplished I am thoroughly inspired!